Towing with your class B motorhome may seem like a complex process. Fortunately, it doesn’t have to be. When visiting congested cities and towns, an RV or class B can be a nightmare to park. One of the many great things about traveling this way though is the freedom you have to be mobile when you travel. Having the ability to bring along a smaller vehicle or boat can make the already versatile motorhome even more alluring. But first, you have to know what your travel vehicle is capable of towing. GCWR – This stands for Gross Combined Weight Rating. What this rating represents is the total weight of your motorhome plus all of the objects, people, food, water, propane and vehicles/equipment being towed. This weight limit should not exceed the recommended GCWR for safely driving your vehicle. GVWR – This stands for Gross Vehicle Weight Rating. This number represents the weight of the vehicle plus its occupants, cargo, fuel, water food, etc. This limit should not be exceeded for the vehicle to operate safely. This number does NOT include towing an additional vehicle or boat. Hitch Weight Rating Plate – The maximum weight of an object (vehicle/boat) that can be towed. OCCC – This stands of the Occupant and Cargo Carrying Capacity. This represents the maximum allowable weight of all occupants (driver included), the weight of all fuel, tools, freshwater tanks and personal belongings. This is the total weight (driver, passengers, fuel, tools, cargo, food, freshwater tanks, dog) that is safe to occupy while operating your RV. These numbers can typically be found in the information manual of your RV/motorhome, or by googling the make and model of your vehicle with the term you’re looking for. Many vehicles also have stickers or labels near the tow hitch that indicate their weight capacity. This is important information to know for your safety. After you have identified the OCCC weight, the GCWR, GVWR as well as the weight of the vehicle or boat you plan on towing, it’s time to do the math. Take your GVWR and subtract the OCCC. You will be left with the weight of your vehicle. Next, estimate and add up how much your cargo, fuel, tanks, occupants and everything else weighs. Take that figure and add it to the weight of your vehicle. Take that figure (weight of vehicle plus your Occupant/Cargo/Tanks figure) and add that to the vehicle or boat being towed (ex: 4,000-lb SUV). Is this final number less than the GCWR? If so, you’re good to go. If not, it will be unsafe to drive your motorhome or RV while towing. So you’ve done the math and your RV or motorhome can safely tow a vehicle or boat. But how do you actually go about doing so? Also known as “toading,” “flat towing” or “dinghy towing,” this is the most popular method of towing a small vehicle due to the little to no effect on your gas mileage. Using a tow bar is also less expensive than investing in a flatbed or tow dolly. When using a tow bar, you will attach your vehicle and let it roll behind your RV. It’s probably the easiest way to tow a vehicle. Make sure the vehicle you wish to tow is capable of being towed by the four-down method. Generally, towing a manual transmission vehicle is easier. Check with the manufacturer of the vehicle being towed prior to attempting to tow it using a bar. Damage to the vehicle’s transmission can be costly. Most Jeeps can be towed without modifications. Many other SUVs and trucks such as Dodge, Ford and Honda vehicles may be capable of towing without a modification, but check first. Use of chains and cables can offer increased stability between your tow car and your motorhome/RV. Aftermarket accessories can be purchased to allow you to use a tow bar on your vehicle. Investing in a drive shaft, disconnecting device, free-wheeling hubs (for vehicles with front wheel drive) and a cable-operated drive shaft disconnecting device (for rear wheel drive vehicles) can help prepare your vehicle for towing. However, be warned that these devices aren’t cheap. Adding a supplemental brake lighting system to the vehicle you are towing is a good idea to let the vehicles behind you know when you have to suddenly brake. One downside to four-down towing is that it can be really difficult (sometimes impossible) to go in reverse with your RV or motorhome when your vehicle is attached. With a dolly, you can tow just about anything you wish — as long as you haven’t reached or exceeded the towing capacity of your motorhome or RV. Tow dollies are essentially what the name implies; your tow car’s front wheels will be carried on a dolly, while its rear wheels follow. Tow dollies are generally best for smaller vehicles, like golf carts, go karts and smart cars. The dolly itself may be too heavy in combination with your vehicle. Many dollies weigh between 500-1500 extra pounds to the vehicle you are towing. This could create a problem by exceeding the weight limit for your motorhome’s towing capacity. Dollies often come with built-in brake light systems, which is convenient for alerting others on the road that you are about to stop or turn. Tow dollies can take up a lot of space, which may be a factor you’ll need to consider at campsites and for storing it at home. Since tow dollies are heavy, make sure you have two able-bodied people to move it. Some states require an additional license plate for a tow dolly. Just like your RV and other vehicles, tow dollies require maintenance on the tires, wheels and frame. Be sure to use two sets of safety chains in order to securely transport your vehicle. You will need one to attach the dolly to the RV, and one to attach the vehicle to the dolly. If you own a larger coach or a fifth wheeler, a flatbed or enclosed trailer may be the perfect solution. Those who love to go off-road or use dirt bikes often transport vehicles via a flatbed trailer. You don’t have to worry about what vehicle you choose to haul when using a trailer. The brake/brake light system is already installed, so you won’t have too much additional work. Trailers are pricey; they can run up to several thousand dollars. If you have the means and ability to store them, they can be incredibly useful for moving. What About Towing a Boat With Your Motorhome? An RV/motorhome and a boat combination sounds like the ultimate outdoor lover’s dream! However, not all motorhomes have the capacity to tow trailers and boats. Be sure to check you owners manual or consult a RV dealer prior to making any decisions. Check your state’s regulations on towing boats. Practice on the boat ramp prior to the real deal. Triple check that everything is secure. Make wide turns. If you turn too tight, you risk the chance of rubbing your boat on the corners of your vehicle. Leave plenty of distance for braking. Be sure you have proper insurance. Towing manual transmission vehicles is easier and simpler than towing newer models with electronic technology. Consider your main purpose for towing a vehicle. If it’s for off-roading, you’ll likely need a vehicle with four-wheel drive. Seating, vehicle weight and transmission will all factor into your decision. Does your vehicle (the one you wish to tow) have a base plate? This is the factory engineered method which allows you to tow your vehicle. Many newer models will not have a base plate. Certain vehicles will need fuses disconnected prior to towing. Refer to your vehicle’s manufacturer manual — both your motorhome and tow car. Don’t forget an auxiliary brake that’s in sync with your motorhome. If in doubt, ask an expert. Towing another vehicle is a big task and you don’t want to get caught in an unsafe or dangerous situation. 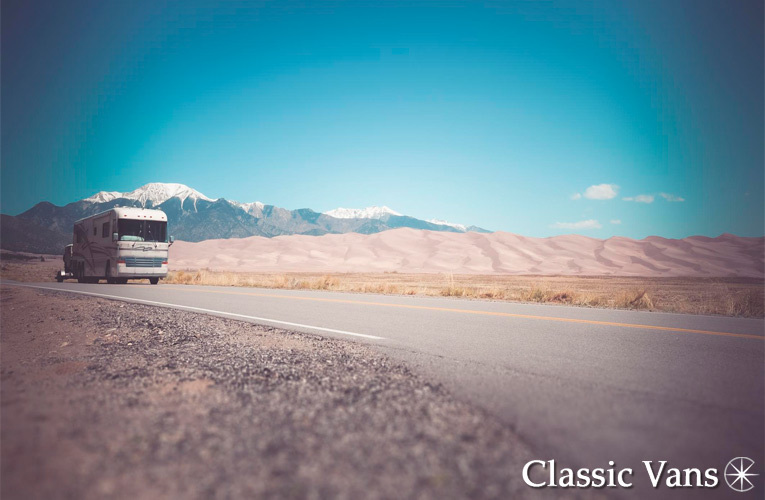 Searching for your next class B motorhome or RV? Browse our selection of quality new and used campervans for sale. Don’t live in California? We deliver nationwide!